Ready to put the finishing touches on a project? Rich Tool Systems has what you need. We carry a selection of 6" by 9" scuff pads perfect for polishing, rust removal, and hundreds of other uses. Our maroon and gray scuff pads are fine aluminum oxide abrasive pads useful for cleaning, finishing, scuffing painted surfaces and more. They can be used with most solvents to help remove rust or perform other tough cleaning duties. They can polish stainless steel to a satin finish. 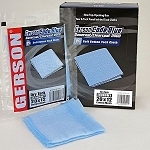 Maroon pads are medium grit with a very fine grain surface, while the gray pads are ultra-fine grit for smoother jobs. Our white scuff pads are non-abrasive, useful for light cleaning and polishing to a consistent finish. At Rich Tool Systems, we pride ourselves on providing you with everything you need to get the job done.